Description Arlene Cloepfil rides a horse at what could be the Lake Oswego Hunt (formerly the Lake Oswego Hunt Club). Photographer's signature on front reads Rabinsky. Arlene's obituary reads, "[Arlene Cloepfil] was born July 10, 1931 in McMinnville, OR to Harry R. and Evelien Hoffarber Kuehne. Arlene was raised on the Bar K Stock Ranch near Carlton. She rode her pony to a one-room schoolhouse, Valley View School near Newberg, through her first eight grades. 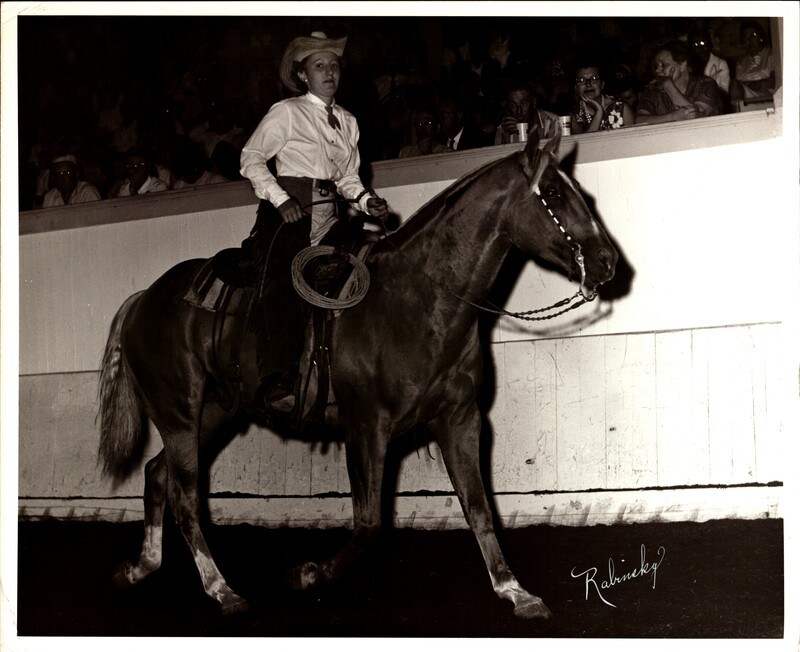 At the age of 9, she performed Roman Horse Riding at the St. Paul Rodeo. Arlene also had trick horses and was involved with competitive riding most of her life."